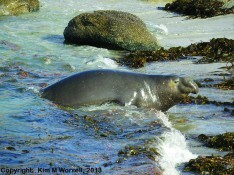 A large elephant seal climbed onto a Pacific Grove beach during the weekend and joined the hundreds of smaller harbor seals that frequent the place. 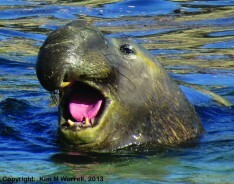 The visiting elephant seal is an adult male, believed to be about 5 years old and weighing an estimated 1,600 pounds or more. He came in about 10 a.m. Saturday while Kim Worrell, a docent with the Monterey Bay National Marine Sanctuary’s Bay Net program, was standing alongside The Coastal Trail at Hopkins Marine Station photographing the variety of wildlife visible from there. 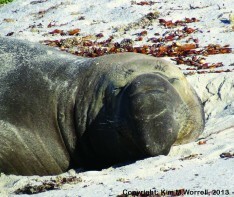 The big guy shimmied to the top of the beach and slept there peacefully for the next few days. 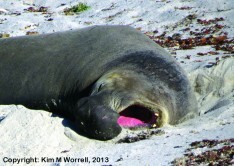 This is believed to be the 6th bull elephant seal that has appeared on Hopkins beach since February 2010, when the first one in known history showed up. Smaller ones have been appearing sporadically since December 2004, usually in winter and spring months, possibly because the population has been growing. 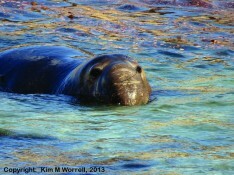 They are presumably visitors from the nearest large colonies – approximately 100 miles south at Piedras Blancas near San Simeon, where as many as 16,000 elephant seals gather in December and January, or 60 miles north at An︠︠o Nuevo State Park above Santa Cruz, where about 5,000 gather. 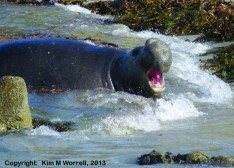 The large bulls are aggressive and can be mean towards the harbor seals that normally use the Hopkins beach, docile animals that may weigh 200-250 pounds. 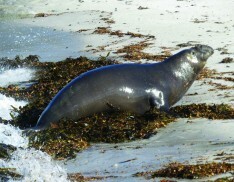 The first bull here in 2010 killed at least one harbor seal in a move to assert mastery on the Hopkins beach. Others have chased the harbor seals away at times, corralled them on one side or the other, tried mounting them, and generally harassed them as bullies will. Earlier this year – in January – there were two bulls on the beach at the same time. They sometimes sparred when not on opposite sides of beach and kept many of the resident harbor seals away and scattered elsewhere. 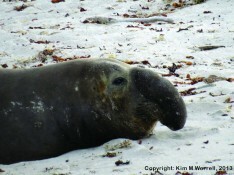 One of the elephant seals – a 6-year-old, 2,000-pound bull that came in last December – ended up staying at Hopkins for 10 weeks with occasional absences of a few hours to a few days. The one that arrived last weekend will stay as long as he wants, of course, and will create whatever mischief he likes while here. Seeing him is probably worth a walk over, even in cold weather.